Palencia Elementary’s First Annual MOJO BBQ Night is Thursday, December 11th! 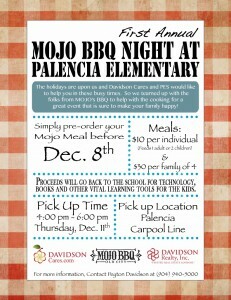 Davidson Cares is very excited to be hosting Palencia Elementary’s First Annual MOJO BBQ Night on Thursday, December 11th between 4 and 6 pm! This is a very busy time of year with the holidays upon us, so Davidson Cares has teamed up with MOJO Old City BBQ to provide your family with a night off from cooking while supporting Palencia Elementary at the same time! 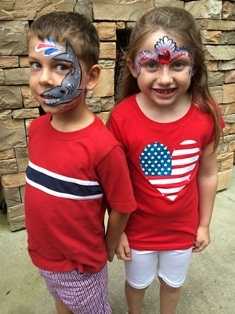 Mill Creek Elementary School’s first annual BBQ Night went off without a hitch last Tuesday, May 27, bringing in $2,040 — $1,020 of which goes directly to the school for books and technology! Catered by MOJO Old City BBQ, the event sold 100 meals including 55 family meals, 11 individual turkey meals and 34 individual pork meals. 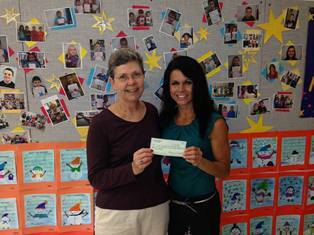 Davidson Realty, which operates Davidson Cares, a non-profit organization that gives grants to local schools like Mill Creek, also had representatives on hand to help. Volunteers handed out pre-ordered meals to Mill Creek parents as they waited in the after-school car line.